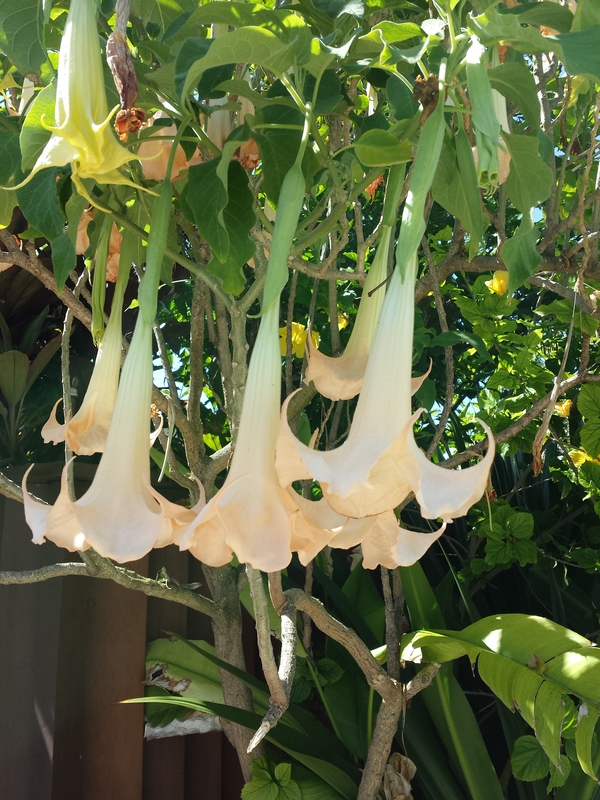 One of the joys of living on Kaua’i is the abundance of vibrant, beautiful flowers everywhere, all year round. Every day here we’re treated to an amazing array of colors and blossoms. 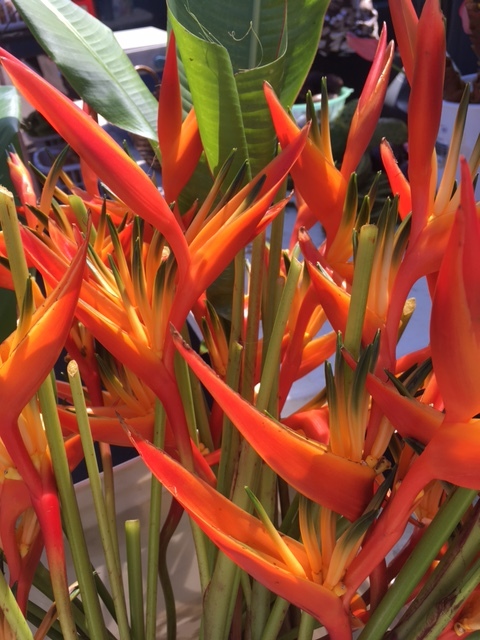 Some of the flowers, like plumeria or gardenia, have intoxicating aromas, but even if they don’t smell I’m still drawn in by the stunning colors on display. Whether we’re at the weekly farmers’ markets or just walking around the neighborhood or wherever, the abundance of flowers provides a daily feast for the eyes. Hawaii’s most famous flower is the hibiscus (the yellow hibiscus is the state flower). Hibiscus bloom year-round, and come is a variety of colors and petal arrangements. 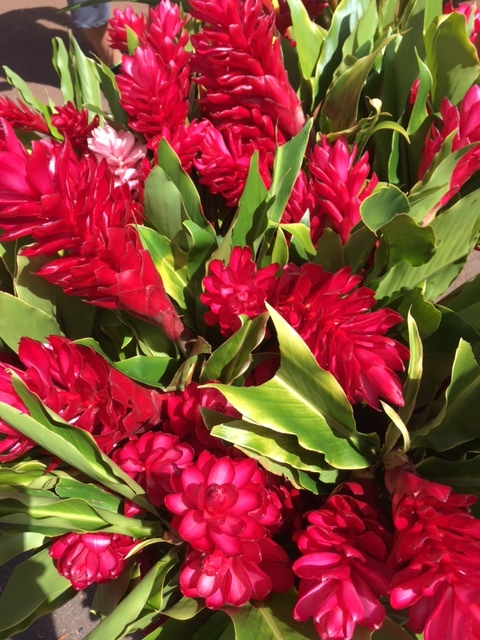 The most common flowers for sale at farmers’ markets are Hawaiian ginger, bird-of-paradise and heliconia, which can be seen year-round. 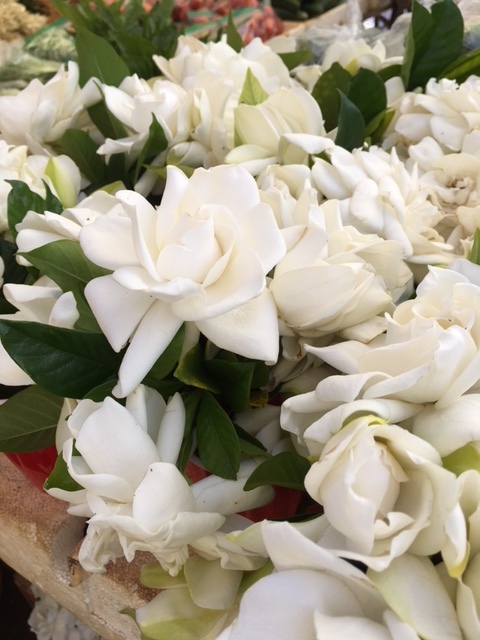 Other flowers, like gardenia, can be found when they’re in bloom. 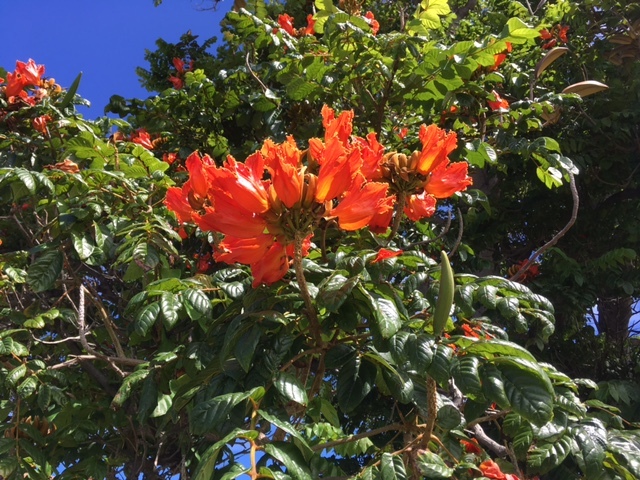 Many trees on the island also get into the act and have striking and colorful flowers. 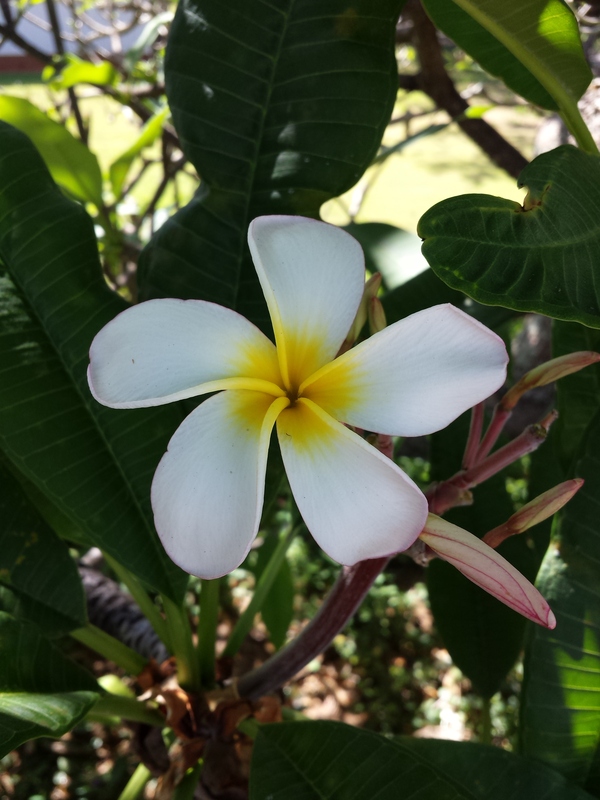 Perhaps the most well-known is the plumeria, with its beautiful, fragrant flowers, often used for lei. At night, when they’re in bloom, we can sometimes catch their sweet aroma on the breeze. The royal poinciana tree is also a delight, with its giant red blooms. 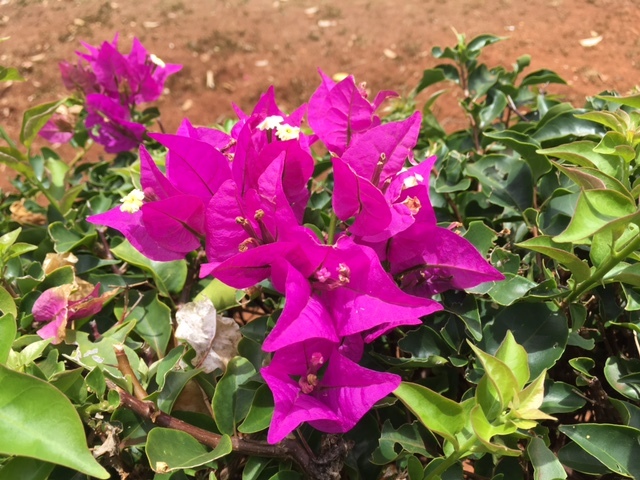 More of a shrub than a tree, bougainvillea can be found everywhere on the island, typically covered with purple flowers but sometimes orange can be found. There are other exotic trees as well with interesting and unusual flowers. Plumeria blossoms can also be a deep, bright pink or white with pink and orange. The tree is seasonal, and during the winter all the leaves and blossoms are gone leaving only thick, bare branches – the tree looks dead! The pictures above show only a fraction of the flowers we’re treated to here all year long, and I have yet to get tired of them, or fail to notice them whenever we’re out and about. 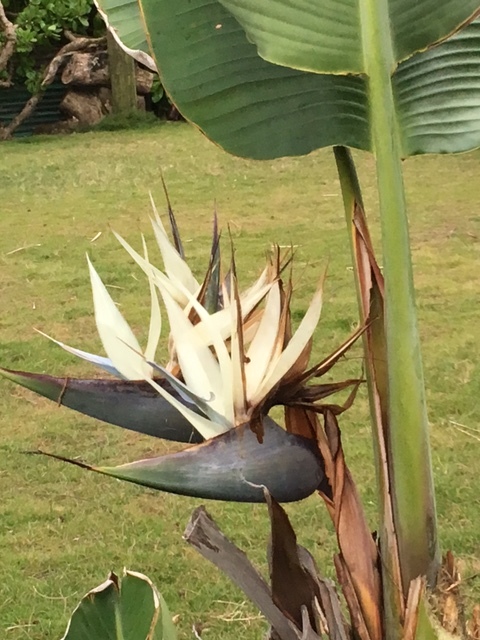 Sometimes we even get lucky, and find something truly unusual, like the white bird-of-paradise we spotted a couple of weeks ago when we were out for a walk – we had no idea they were in any other color than bright orange! Previous Post This Week’s Menu: Two Celebrations in One! How pretty! Thanks for sharing those beauties with us. I hope one day I can make it to Hawaii. After nearly three years here I have yet to grow tired of seeing all the flowers. They take my breath away every day. 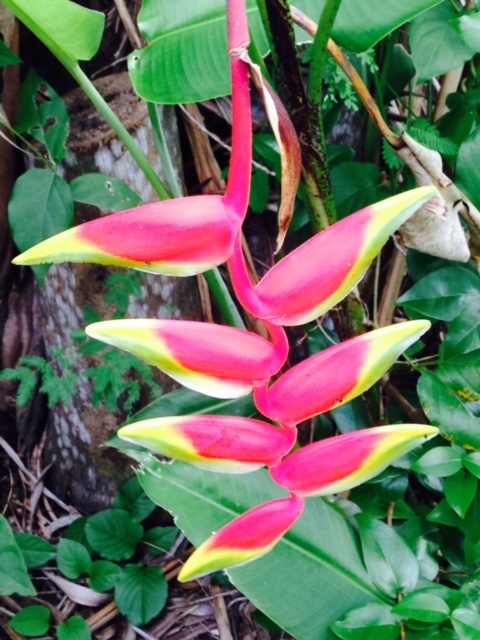 I love and miss tropical flowers. I call it “colour therapy” whenever I go to tropical/ subtropical places. The flowers are abundant and their colours are so vibrant. The sunlight also makes the colours seem more intense. Thanks for sharing. The colors are amazing. It took me a while to see all the variations in the hibiscus, but once I caught on I keep seeing new colors and varieties all over the place. Beautiful flowers! Thank you for sharing. During my visits to Honolulu, on the drive to her house my aunt always made sure to point out the night-blooming cereus growing by the lava rock wall at the Punahou School. She explained that they only bloomed at night. It always reminds me of her. OK, now I’m going to have to stay up and go out to see if I can find any night-blooming cereus! The flowers at the farmers’ market sell out VERY quickly every week. There are vendors with flowers as we enter the market, and by the time we’re done and walk back out their buckets are almost empty.